Stina P: It's a dress! I know! 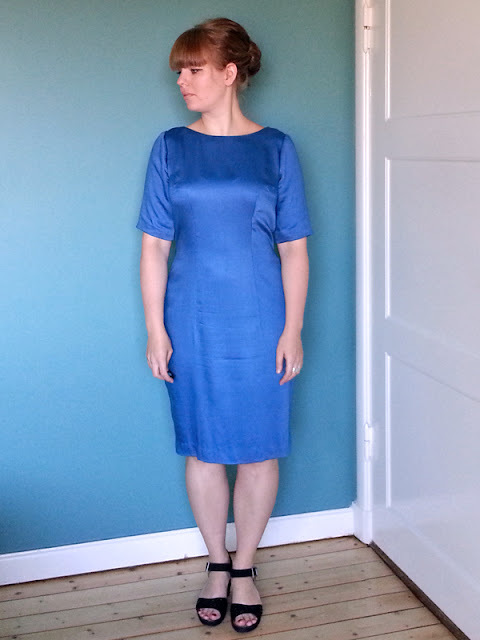 And it's not a two-year project that I finally finished; it's a dress from pattern to hemming in just two weeks (and that's rather impressive to be me)! But most importantly, it's been fun. As you might have sensed during the spring; I haven't sewn, I've had a major wardrobe and style crisis, and also a bit of identity crisis - if I don't sew, what do I do? 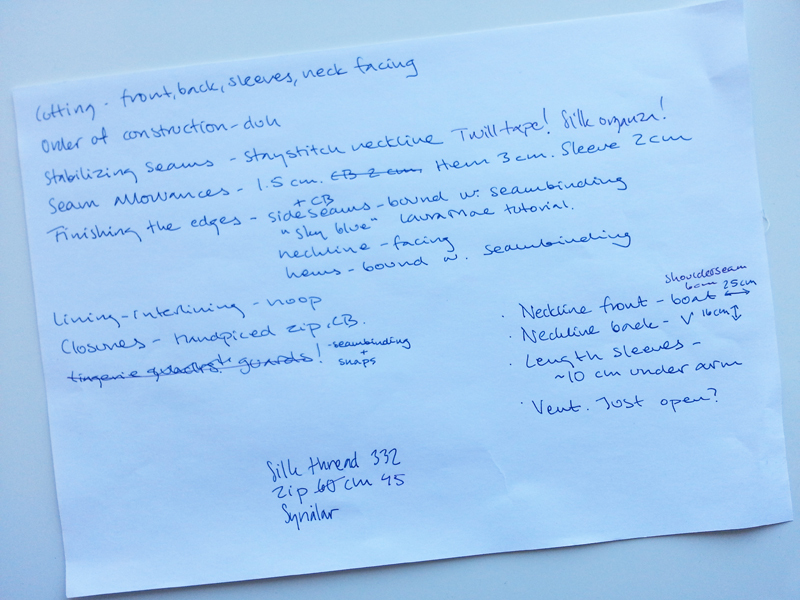 Anyway, the pattern is my own; the Ultimate Dress Pattern but let's say we're not quite there yet. There's still something about those sleeves. And I didn't make it in the Liberty fabric as planned, since I just couldn't decide on sleeve length, and neckline and lining or no lining and I went crazy with not being able to just do it, so I changed the fabric to this lovely sky blue cotton sateen (cotton satin?) that I bought last time in Paris. I did some project planning and started to cut. Oh well. Since the last I sewed was the slippery fluid fabric from h*ll (also known as silk charmeuse and an absolutely a dream to wear) I thought it would be nice with a simple cotton. Ha. This was almost as fluid as the silk and didn't want to get cut at all. And for some reason, very difficult to mark. A bit hopeless to sew and press as well, and my, does it wrinkle! The fabric is a bit too drapey for the simple and rather structured design I chose; it would be better in a more stable fabric. I didn't think at all about combining the right pattern with the right fabric; I just thought cotton and summer. So next time. And some tweaks for the sleeves. 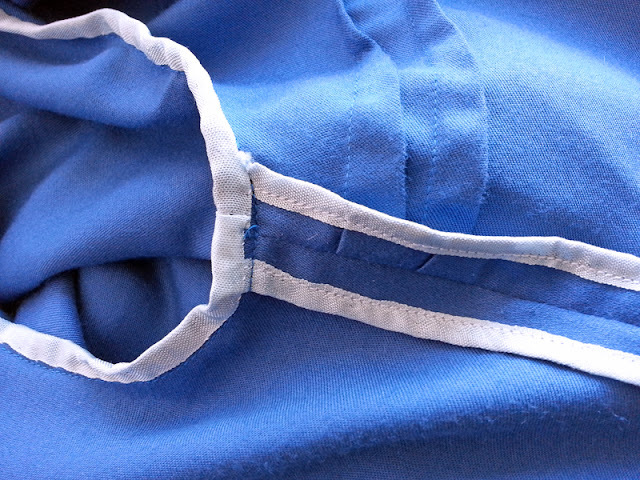 But I did like seam binding in the armscyes, but sewed it by hand. I think it went almost as fast as with the machine, no harsh words were uttered and the result turned out so much nicer. I supported the facings and the entire centre back seam with silk organza, and stabilised both shoulders and neckline (front and back) with twill tape. The zipper is handpicked; both because I think it's the safest way to insert one(I've never had to insert a zipper more than once when I do it by hand. When I do it on machine there's always some little mess and I have to un-pick at least a bit.) and because I think pick stitches are so fun to sew. 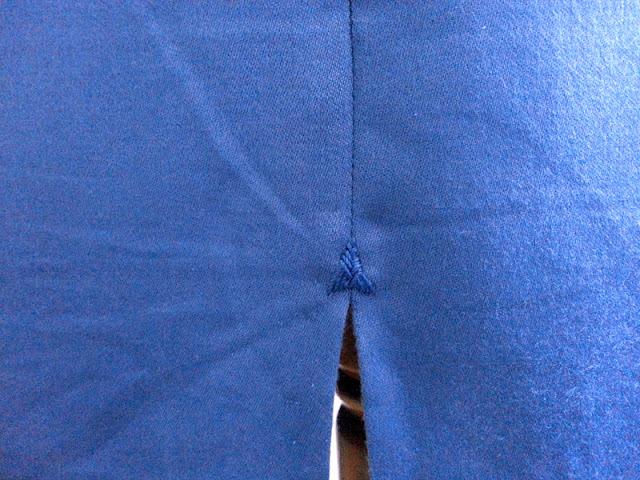 So that's what I used to understitch the facings as well. As you can see above; double darts in the back, and the handpicked zip. When the dress was almost finished - just the hemming left - I remembered that I read about the couture way to sew a facing. I must remember that next time; I really don't like the standard way of sewing right against right side, flip over, notch and understitch. Now I need to remember that for my next dress. 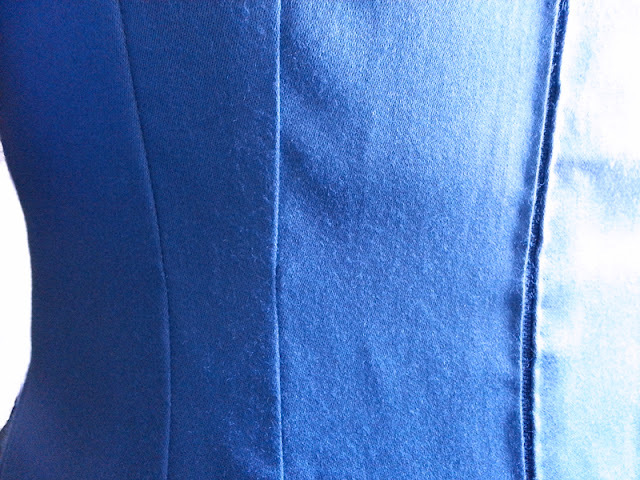 The hem and sleeves are first clean finished and then hemmed by hand. And I even did a little arrowhead tack (or at least, my version of an arrowhead tack...) at the end of the slit with silk buttonhole twist. So what's next? I really must give some of my vintage dresses some love so I can wear them a bit more. And I have a baptism coming up in October and what better to wear than a dark blue pencil skirt in lace? Jättefin!! Jag är heller inte så förtjust i den där "rayon seam binding". Mycket jobb, och ofta inte perfekt resultat i alla fall... Men stort plus för handsytt blixtlås! !